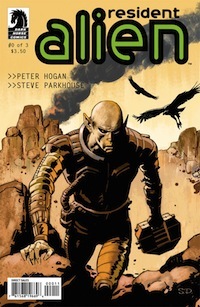 Resident Alien provides a sci-fi twist on a retirement tale. You’ve seen the story before, of a smart detective pulled back into work by the right case. Only this time, the investigator is particularly different. An alien just wants a peaceful life until he can be rescued from Earth and return home. The only time he uses his powers is to hide his appearance from his neighbors. However, when the town doctor gets murdered, he’s the only medical man left in the area, so he’s enlisted to take care of the inhabitants until they can find out who did the killing. This zero issue, first of four planned, reprints three stories that ran last year in Dark Horse Presents. It’s a great introduction to the characters and setting, which has a strong presence as well. That was one of the many elements that attracted me to the series. Small-town folk have been used in fiction for a long time and in a lot of different ways. So far, this appears to be balancing them well, emphasizing the closed society (made more obvious by how alien our hero is) as well as the good-people-helping-each-other tendencies. Steve Parkhouse’s art is terrific in making the alien classically creepy (in the pattern of the Greys, although he looked more lavender to me) but also balancing the portrayal against the everyday people. His alien seems to come from the same world they do, in terms of coordinated art style. He’s also great with the scenery. Peter Hogan, meanwhile, gives us just enough to sympathize with a guy who just wants to be left alone and who’s trying to fit in based on what he’s seen on TV. It’s a neat trick, getting us to put ourselves in the place of the alien, seeing the people as the ones who are hiding something. It helps that we’re shown some potential motives for the secrecy of key citizens, although the murder case itself will play out in future issues. I’m already eager to see more. Resident Alien #0 is on sale next week. The publisher has posted a preview and provided a digital review copy. This four-issue storyline was collected as Welcome to Earth!.